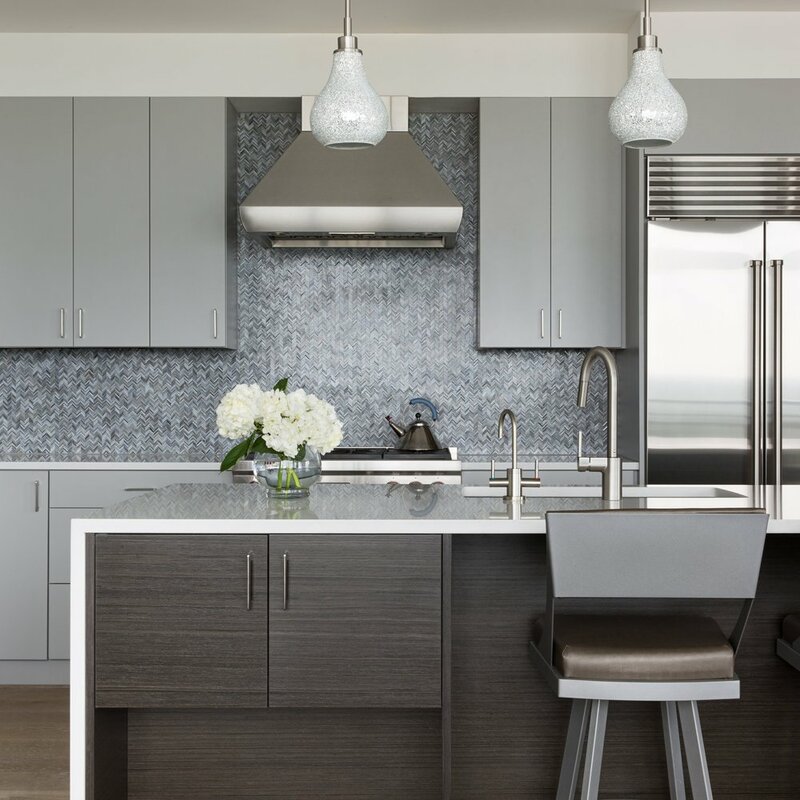 After consolidating a lake house and a downtown condo, this 78704 property needed an overhaul to reflect the sophisticated yet modern style of the clients. The addition of a fireplace wall as well as a neutralized color palette helped land this project on the pages of Home Design & Décor magazine as well as winning it multiple awards in the ASID Design Excellence competition. Commissioned art and custom furniture make the project a one-of beauty. The home, purchased as a recent speculative remodel, included fluff space off the kitchen with greenbelt views and floor to ceiling sliding doors. The space was given an identity with dueling sofas, custom draperies, clustered lighting and pops of color. An addition of a custom breakfast bar, featuring tone-on-tone wallpaper, allowed the space to perform duel functions of casual dining and conversation. Seen by thousands on the Modern Home Tour, this new construction project was inspired by the client's love of the Death Star from Star Wars. It also snagged an award at the ASID Design Excellence competition. Ultimately winning an award for “Residence-Traditional”, steps were taken to cozy the space which included new industrial decorative lighting, adding variations of warm gray paint colors, remodeling bathrooms and sourcing rustic modern furnishings. As seen on the 2015 HBA Parade of Homes, this project took home several awards at the annual ASID Design Excellence competition. The clean lines of the home are complimented with rich furnishings infusing color and texture into every space. Wall finishes are the star of the show in this contemporary home including graphic paint, chic wallpaper and rich walnut. These elements helped win 1st place in the Contemporary Residence category and unique furniture and accessories created a one-of-a-kind look. With beautiful bones to work with, this project entailed procuring one of a kind furnishings and priceless artifacts to create a truly unique space. This award-winning project exudes a well-traveled ambiance rich in color, texture and history.